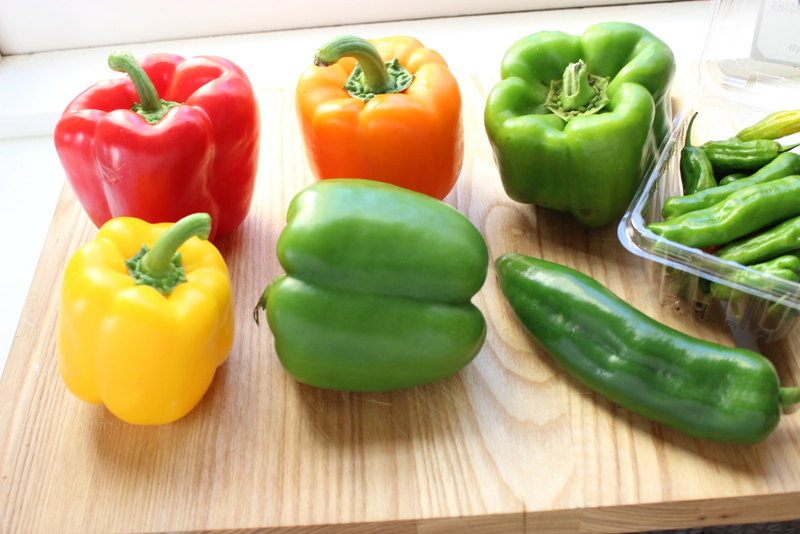 The method: The concept is pretty simple: hollow out bell peppers and stuff with a mix of grains, ground meat, and vegetables. Browned ground beef and rice is the standard, but I like grains and legumes to serve as the “meat”. To make the preparation more weeknight-friendly, I have taken to cooking the grains a day or two before; I just make some extra bulgur or quinoa at a prior meal so there are leftovers. Then saute some aromatics until tender, add the grain to heat through, and toss with flavor-packed pantry items (like fresh herbs, sun-dried tomatoes, olives, canned beans and so on). Spoon into the peppers, cover with the stem, and bake until completely tender and the filling heats through (it’s best to err to the side of really cooking the crap out of the peppers so they are tender) . 1. Get prepped: Heat the oven to 425F. 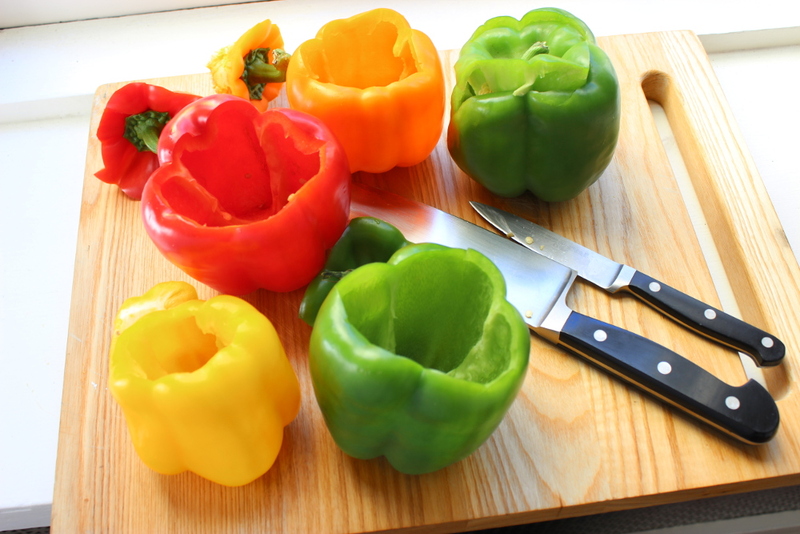 Using a paring knife and working in a circular pattern at the top, core and stem 4 bell peppers (about 1 1/4 lb; use whatever colors you like). Slice off and discard the seed core but save the stems. Peel 2 carrots (about 8 oz.) and cut in 1/2-inch dice. Finely dice 1 red onion (about 8 oz)..Trim 4 oz green beans and cut in 1-inch pieces. 2. Saute the filling: Heat 2 Tbs. olive oil in a 12-inch skillet over medium-high heat. Add the diced carrots and onion, sprinkle with 3/4 tsp. kosher salt and cook, stirring, until the onion browns lightly and becomes tender, about 6 minutes. Add the green beans and 1 tsp. ground cumin and saute for 2 minutes. 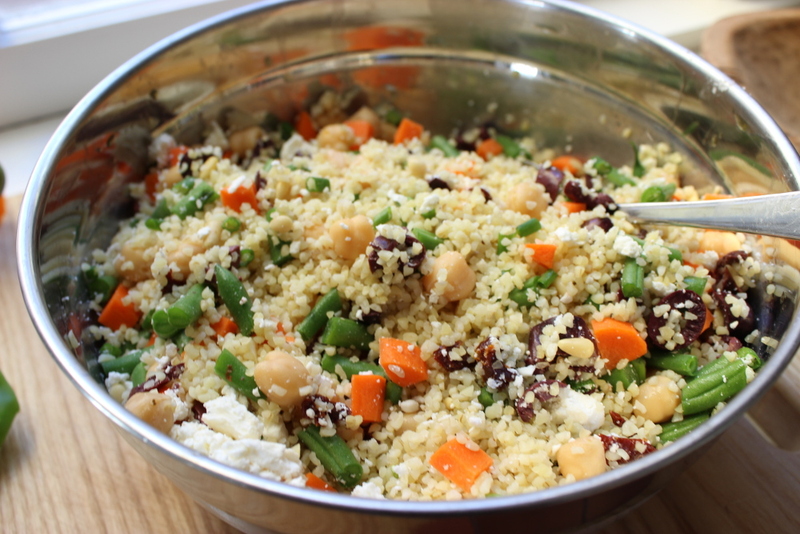 Remove from the heat and toss with 3 cups cooked bulgur (or quinoa), 1 cup canned garbanzos, 4 oz feta (crumbled, about 1 cup), 3 scallions (trimmed and thinly sliced), 1/4 cup chopped Kalamata olives, and 2 sun-dried tomatoes (chopped). Taste for salt and pepper. 3. 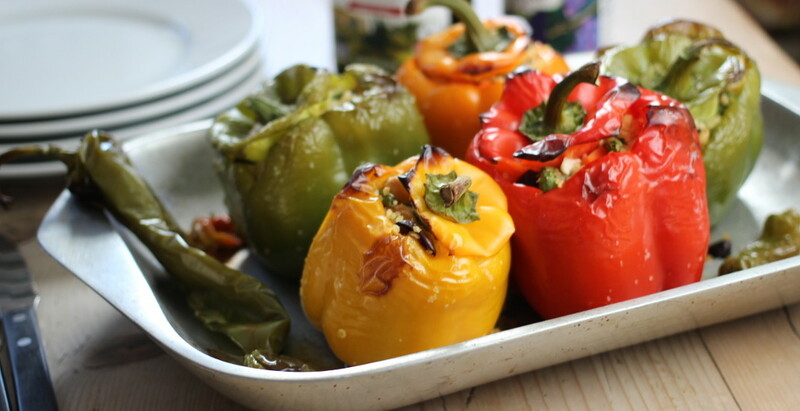 Bake the peppers: In a large bowl, toss the cored peppers with 2 Tbs. olive oil, 1 tsp. kosher salt, and 1/2 tsp. black pepper. 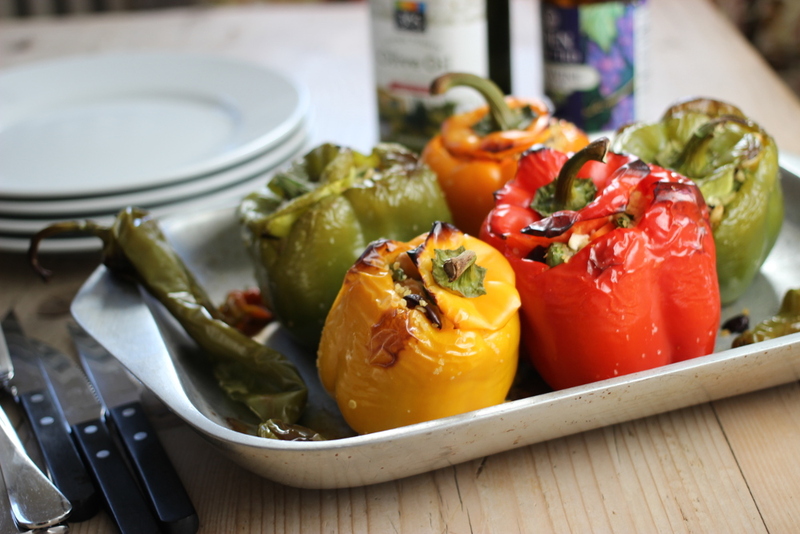 Set the peppers, upright, on a roasting dish and spoon the filling into each. Top with the stem and bake until the peppers brown and are completely tender and the filling is completely heated through, about 30 minutes.